A father-of-three was "knelt on" by up to eight police officers on the night he died, a court was told. Sharon Powell told how she arrived at her mother's house in Lozells, Birmingham, to see a number of officers restraining her brother Michael Powell. He was then shoved onto the floor of a police van, she said. Mr Powell, 38, was dead within two hours. 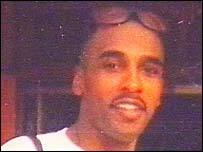 Ten policemen are on trial charged in connection with the death of Mr Powell, who died on 7 September 2003. He had been hit by a police car, sprayed with CS gas, struck with a baton and restrained on the floor before being taken into custody, the trial at Leicester Crown Court has heard. Miss Powell told the jury: "I was just in shock. I was upset when I got there. "All I remember was that they were on top of him. They were actually leaning down on him. "They were there for a while from the time I got there. He was too long on the ground. "He should not have been there that long on the ground." Asked under cross examination what happened next, she added: "They picked him up and carried him in (to the van). They shoved him in the van on the floor. "I wanted to go with him and they would not let me." Pcs Tim Lewis and David Hadley deny dangerous driving and battery. Eight officers - Acting Sgt Chris Wilson, Insp Tony Guest, Pc Steven Hollyman, Pc Nigel Hackett, Pc Luke Gill, Pc Lee Howard, Pc Andrew Edwards and Sgt David Williams - deny charges of misconduct in a public office.